HiR Information Report: Geek comics Now and Then. I made an observation a few days ago. Ever since Randall Munroe passed 400 xkcd comics, it's pretty hard to run across a situation or discussion where you can't drop in a relevant link to one or more of them and seem to be staying on topic. Example: Information Is Beautiful posts a graph of caffeine content vs. calories of some of our favorite beverages. 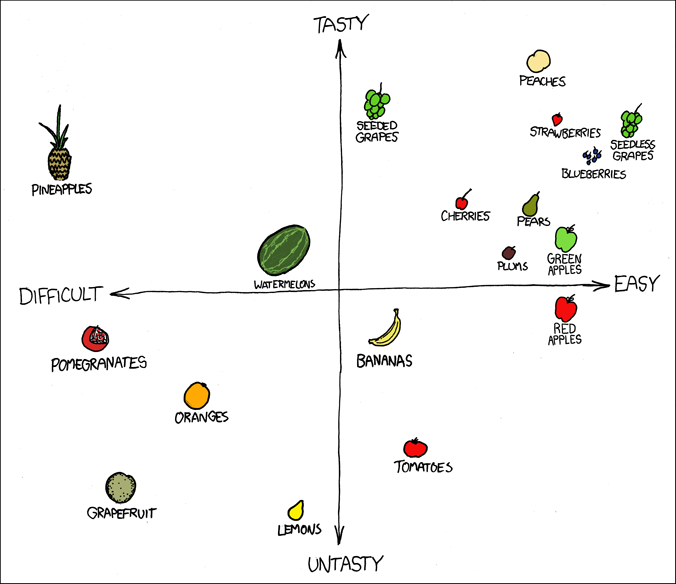 I counter with xkcd #388 comparing the tastiness of fruits vs. the ease of their consumption. This, of course, requires a little bit of knowledge of past cartoons and possibly what they were named or some of the text within. All of this got me thinking about The New Hacker's Dictionary, Which is an old, old piece of work, the most recent edition released in 1996. It's basically Eric Raymond's "Jargon File" with some Crunchly illustrations from Guy L. Steele, Jr -- a.k.a. The Great Quux. -- of course, now all that content has been html-ified and all the other fun stuff from the book has been added to ESR's online Jargon resource. 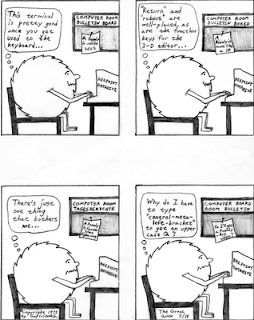 Crunchly was basically then what xkcd is now. Except we didn't have the web back then. And by "back then" I'm talking about the 1970s, therefore by "we" I'm talking about you old people, because I was born in '79. Note, GLS often participates in Burma-Shave -esque verse and other wordplay in the background of Crunchly's monologues. Not much different than the mouse-over easter eggs on xkcd.